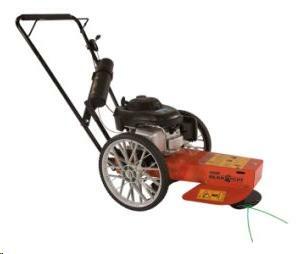 High weed mower line type. Bear Cat model #74450, 5 hp Honda pushtype. 24" cut, 81 lbs, length 50" Height 38", 21" wide, fuel cap. 1.2 qt. * Please call us with any questions about our mower high weed line type rentals in Sacramento and Citrus Heights, serving Auburn, Placerville, Woodland, Davis, and Elk Grove in the Sacramento area.